A gasoline piston engine that can dynamically change its compression ratio —that is, the amount by which the piston squeezes the fuel-air mixture in the cylinder—has long been a holy grail of engine design. 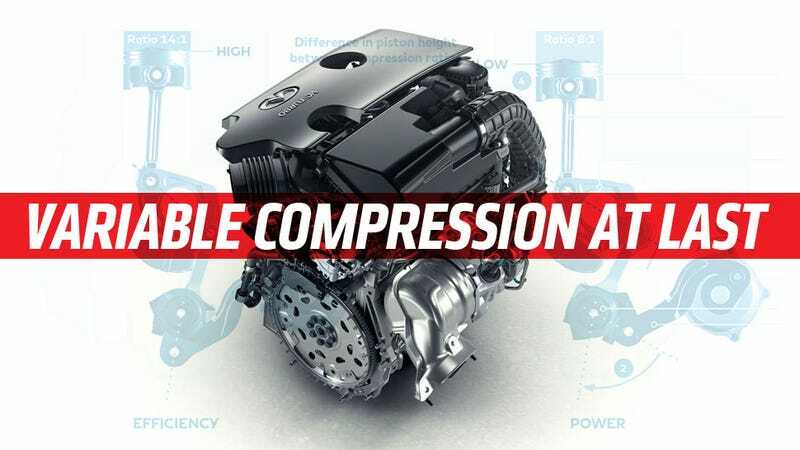 It looks like Nissan is the Indiana Jones of engine design, then, because its luxury division Infiniti will introduce the first production variable compression ratio engine in the 2018 Infiniti QX50. Could this be the death knell for diesel? The ingenuity of VC-T engine technology lies in its ability to transform itself and seamlessly raise or lower the height the pistons reach. As a consequence, the displacement of the engine changes and the compression ratio can vary anywhere between 8:1 (for high performance) and 14:1 (for high efficiency). The sophisticated engine control logic automatically applies the optimum ratio, depending on what the driving situation demands. ... though, really, it’s actually a bit more complex than that. Low compression isn’t really “high performance.” Racing engines tend to be very high compression, with NASCAR engines, for example, having a compression ratio of 12:1. High compression is also more efficient, so it would seem reasonable to ask why not just make engines that are constantly at high compression? The reason is that high compression also causes knock, or unwanted pre-detonation of fuel. A diesel uses compression only to ignite the fuel/air mixture, and the same thing can happen with a gasoline fuel/air mixture at high compression levels, causing detonation at the wrong times. So, the variable compression ratio engine can drop the ratio during periods of high turbocharger boost to keep knock from happening, while increasing the ratio during periods of lower boost, for greater efficiency. This gives both more power when needed, and better economy when not. Also, the engine is equipped with variable valve-timing technology, allowing the engine to operate like an Atkinson-cycle engine during low-demand driving. Atkinson cycle engines hold the intake valves open a bit longer to let some air escape and lower the effective compression ratio as well, for better efficiency. They’re usually found in hybrids, where the electric motors can compensate a bit for the lack of oomph. That’s why engines like this have the potential to replace diesels in many contexts, possibly (and I’m speculating here) including eventual lower-cost versions for countries where diesel is the primary fuel like India. Perhaps this could be in the form of a variable-compression two-cylinder gas engine designed for small passenger cars? The flexibility of the engine seems to be very impressive. It manages to do the variable-compression trick via, according to their patent and Infiniti drawings, via a sort of multi-link piston rod. The piston rod has a central pivoting multi-link that can change its angle, which in turn changes the effective length of the piston rod, which changes the amount the piston moves in the cylinder, which, finally, changes the compression ratio. It seems to be a very clever system, though it does seem dramatically more complex than a single, dumb, forged piston rod. That may be why Nissan says the engine makes sense as a four and not a V6 or V8; the cost of all these articulated piston rods may be just too high. I’m guessing, but that seems plausible. In a hybrid context, an engine like this would be hard to beat in terms of across-the-board power and efficiency, thanks to its ability to dynamically adjust how it behaves. It could be a relatively high-compression Atkinson engine supplemented with electric motors, all the way to a lower-compression but very highly boosted performance engine, all in the same car. The engine will be officially revealed on September 29 at the Paris Motor Show.